Sometimes its good to freshen-up some “hidden” knowledge. Its somewhere in your head, but it just needs to be freshened. One of these things is the Client Push Installation. In this post I will try to tell the story of the server side. There must be a Client Push Installation –account defined in the Accounts tab of the Client Push Installation Properties. The Client Push Installation –account must be a member of the local Administrators group on the targeted computer. 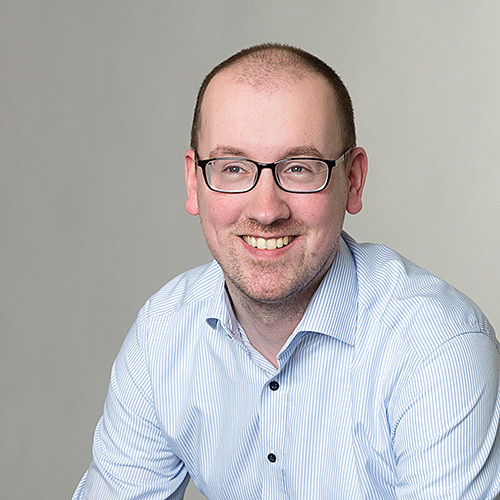 The targeted computer must have been discovered a ConfigMgr discovery method. The targeted computer must have an ADMIN$ share. The targeted computer must be able to contact a management point in order to download supporting files. See for more information my previous post about the ports used by a Client Push Installation. There a two methods of installing a ConfigMgr Client using Client Push Installation and I will described them both here, automatic and manual installation. Open the Configuration Manager Console and browse to System Center Configuration Manager > Site Database > Site Management > <YourSiteName> > Site Settings > Client Installation Methods. Select Client Push Installation and click in the Actions pane Properties to open the Client Push Installation Properties. 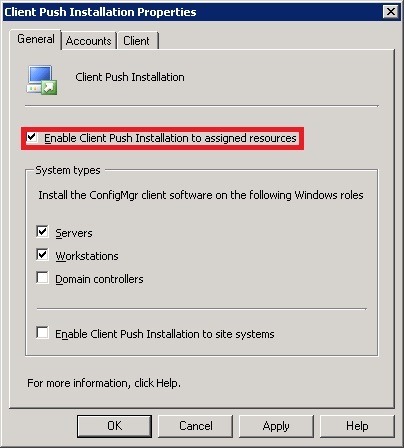 On the General tab select Enable Client Push Installation to Assigned Resources. (Prerequisite) On the Accounts tab specify an account to use when connecting to the targeted computer to install the client software. (Optional) On the Client tab specify any additional installation properties and click Ok. Important (! ): The specified installation properties, on the Client tab, must be for the client.msi. Also, the specified installation properties are published to the Active Directory if the schema is extended. These properties are used by client installations where the ccmsetup is run with no installation properties. (Prerequisite) On the Accounts tab (of the Client Push Installation Properties) specify an account to use when connecting to the targeted computer to install the client software. (Optional) On the Client tab (of the Client Push Installation Properties) specify any additional installation properties. Navigate to System Center Configuration Manager > Site Database > Computer Management > Collections. Select the collection or computer in a collection you want to push the client to. 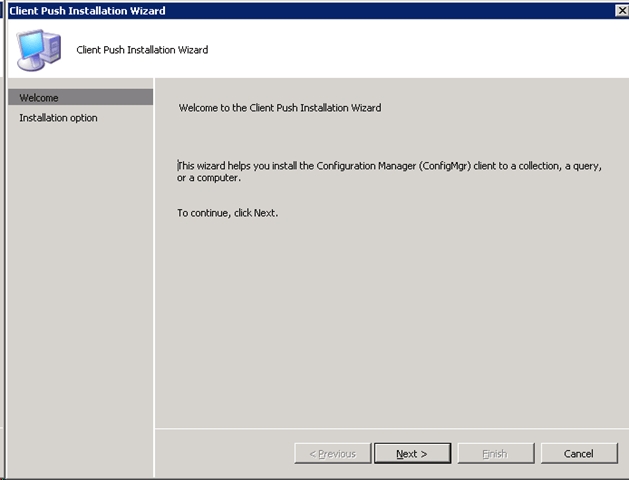 Right-click the computer or collection and then select Install Client to launch the Client Push Installation wizard and click Next. On the Installation options page, specify the client installation options that should be used and click Next. After a Client Push Installation is initiated a Client Configuration Request (CCR) –record gets created for each targeted computer. These records are created in <InstallationDirectory>\inboxes\ccr.box. As soon as the CCR –record gets processed it will be moved to <InstallationDirectory>\inboxes\ccr.box\inproc. Based on the information of the CCR –record there will be a connection to the ADMIN$ share on the targeted computer. After the connection with the ADMIN$ was successful there will be a connection with the registry (IPC$), of the targeted computer, to gather information. Now the file copying will start. The MobileClient.tcf (from <InstallationDirectory>\bin\I386), the ccmsetup.exe and any needed updates (from <InstallationDirectory>\Client) are downloaded to ADMIN$\ccmsetup on the targeted computer. After this the last thing that happens from the server-side is the verification whether the ccmsetup service is started successfully or not. When the ccmsetup –service is started successfully the CCR –record will be deleted and when the ccmsetup –service is not started (or created) successfully the CCR –record will be moved to <InstallationDirectory>\inboxes\ccrretry.box. Standard behavior is that those records get evaluated every hour. Extra: If a installation fails and you want to prevent it from retrying every hour, just delete the corresponding CCR –record from the ccrretry.box. ConfigMgr vNext: It just gets easier and easier.